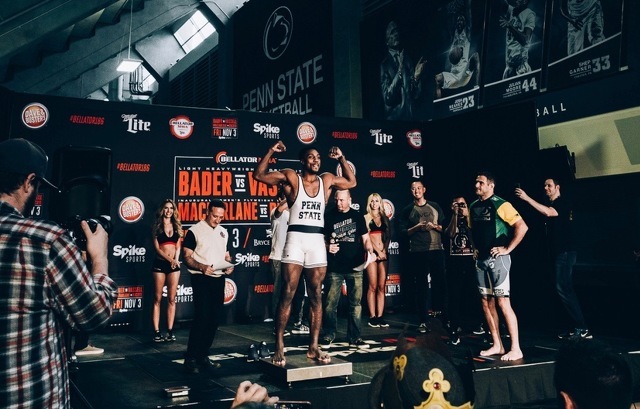 Penn State wrestling greats Phil Davis and Ed Ruth return to town for Bellator MMA at the Bryce Jordan Center on Friday, Nov. 3. Photo by Oyoma Asinor | Onward State. There's much to see and do around the region this weekend. Military Appreciation Week kicks off with First Friday, Bellator MMA makes its Jordan Center debut, Yo-Yo Ma performs at Eisenhower Auditorium and The Second City brings its improv and sketch comedy tour to The State Theatre. Enjoy concerts, art, theater, fall festivals, sports and more. We've compiled a few of the highlights from each day. Satirist Bassem Youssef, dubbed the “Jon Stewart of Egypt,” will speak at two events at Penn State this weekend. Youssef will deliver a lecture titled “The Joke is Mightier Than The Sword” at 4:30 p.m. on Friday at the Nittany Lion Inn. On Saturday at 5 p.m. in the Katz Building Auditorium he and director Sara Taksler, a senior producer of "The Daily Show," will participate in a discussion following the film screening of "Tickling Giants. Seating for both events is first-come, first-served. A week of military appreciation events in State College and at Penn State kicks off with the State College Downtown Improvement District's monthly First Friday celebration from 5-9 p.m. A variety of military appreciation activities will take place on the 100 block of South Allen Street, with more happening around town. Check out the details and what else is in store this week here. The internationally-recognized photo exhibit "They Have Names," showcasing the children of Syrian, Afghani and Iraqi refugees, begins a two-month exhibit at venues in State College and at Penn State with a reception and talk at 5 p.m. at Webster's Bookstore Cafe. The project was jointly created by German photographer Daniel Sonnentag and Penny Eifrig, a Lemont resident and owner of Eifrig Publishing, along with her daughter, Saede Eifrig, a 2017 State College Area High School graduate, who met Sonnentag while volunteering at the ICC Refugee Camp in Berlin, Germany, over the past two years. Bellator MMA makes its Bryce Jordan Center debut at 6:30 p.m. Light heavyweight champion Ryan “Darth” Bader will make his first title defense against British sensation Linton “The Swarm” Vassell. Two Penn State wrestling greats will be competing as well, with Phil “Mr. Wonderful” Davis in the light heavyweight feature bout and Ed Ruth in the middleweight feature bout. Randy Couteur will be on the concourse from 6:30-8:30 p.m. for photos and autographs. Cellist Yo-Yo Ma will make his third appearance at Penn State when he performs in concert with pianist Kathryn Stott at 7:30 p.m. in Eisenhower Auditorium. Ma, whose career is defined by a desire to find musical connections across cultures, and Stott, a fixture on the international music scene for decades, have performed together for more than 30 years. It's the final night to catch Penn State Centre Stage's production of "Argonautika." Written by Tony Award-winning director Mary Zimmerman, the show is a modern take on the old tale of "The Voyage of Jason and the Argonauts." Show time is at 7:30 p.m. at the Pavilion Theatre, University Park. Legendary Chicago sketch and improv comedy theater The Second City brings its "Cure for The Common Comedy" tour to The State Theatre for an 8 p.m. show. Our Lady of Victory will host its annual fall bazaar from 9 a.m. to 4 p.m. in the school gymnasium, 800 Westerly Parkway. Admission is free. Eat on location all day or take home a wide variety of foods. Enjoy live entertainment while shopping for crafts and toys, buying raffle tickets for theme baskets, or bidding on silent auction items. There also will be games for children. A big-screen TV will show the Penn State-Michigan State football game. Good Shepherd Catholic Church, 867 Grays Woods Boulevard, will hold its fall festival from 10 a.m. to 4 p.m., with vendors selling goods and handmade crafts; baskets to be raffled, and the kitchen selling baked goods, soup and sandwiches. The State Theatre's 2017 blues festival gets started at 6 p.m. with a lineup including Gabe Stillman & The Billtown Giants, Felix and the Hurricanes, Triple A Blues Band, Ramblin’ Dan Stevens and headliner Tab Benoit. Gio’s of Woodland, Pa., will be selling plates that include 3-rib bones, pulled pork, and black beans & rice for $7. As always, The State Theatre will have great local beer for sale. Ranked No. 1 in the nation, the Nittany Lion women's volleyball team returns to Rec Hall to face Rutgers at 7:30 p.m. The Penn State Glee Club will perform its fall concert at 7:30 p.m. at Pasquerilla Spiritual Center, University Park. Program will include works by Josquin Des Prez,Felix Mendelssohn, Malcolm Dalglish and Gilbert and Sullivan, selections by the Hi-Lo’s and many Penn State songs. Admission is $4.99 for adults and $2 for students, cash only at the door. The State College Choral Society opens its season by exploring sacred rhythms from Argentina to North America, featuring the "Misa Criolla" and "Navidad Nuestra" by Ariel Ramírez and "To Hope! A Celebration" by Dave Brubeck. The performance begins at 7:30 p.m. at Grace Lutheran Chucrh, 205 S. Garner St. The Nittany Lion men's basketball team takes the court at the Bryce Jordan at noon for an exhibition game agains Bloomsburg. "Violet and Beaumont" author Abby Rupert Baus will be in the Children's Creativity Center at the Bellefonte Art Museum, 133 N. Allegheny St. from 12:30 to 3:30 p.m. She will be reading to children and signing copies of her book. The museum also hosts its First Sunday exhibit openings. There's Science in My Ice Cream! Pasto Agricultural Museum, 2710 W. Pine Grove Rd., Pennsylvania Furnace, hosts its annual ice cream social from 1 to 4 p.m, with faculty researchers from the Penn State College of Agricultural Sciences revealing the science behind making Creamery ice cream. In addition to live music and hands-on activities for the entire family, there will be lots of ice cream to eat. Discovery Space offers a free STEM program for families at 4 p.m. An hour of hands-on STEM learning with an astronomer, this program will focus on astronomy and is for parents and children ages 6-10 working together. Call (814) 234-0200 to register. If space is available, walk-ins will be allowed. Nittany Valley Symphony presents Virtuoso/Variation at 4 p.m. in Eisenhower Auditorium, with violin virtuosity and orchestral variations. Program includes Blacher, Paganini and Tchaikovsky. 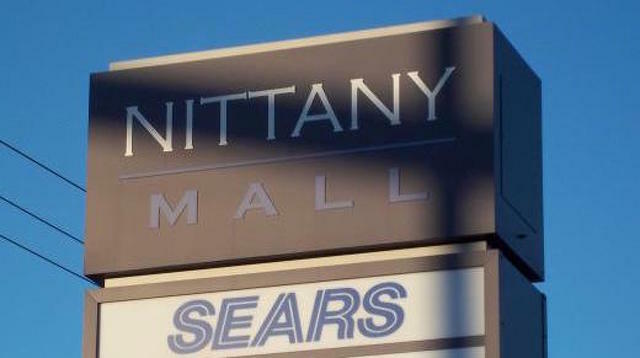 The Nittany Mall is losing one its anchor stores. Sears Holdings announced on Thursday that it will close 18 Sears stores and 45 Kmarts around the country. The Sears at the Nittany Mall in College Township is among them. A company statement said associates were informed on Thursday that the stores would close in late January 2018.